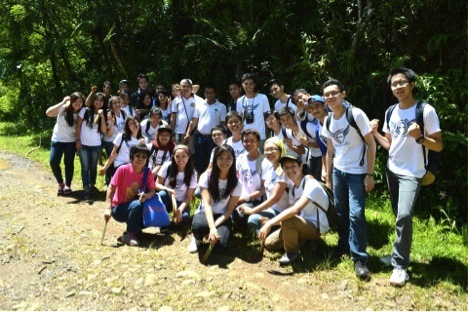 2014 GeneSoc Youth Step up Drive for Reforestation in UP Laguna-Quezon | FEED, Inc.
September 27, 2014 | Laguna-Quezon Land Grant, Siniloan, Laguna. In collaboration with the Philippine based NGO Fostering Environment & Education Development (FEED), the University of the Philippines-Los Baños (UPLB) and the Land Grant Management Office (LGMO) of UPLB, the UPLB Genetics Society (GeneSoc), and Armed Forces of the Philippines (AFP, First Infantry Battalion, Second Infantry Division), 1030 seedlings were planted in a hectare portion of the Laguna-Quezon Land Grant (LQLG) at Siniloan, Laguna last September 27. Headed by FEED Board of Trustees member Dr. Asuncion K. Raymundo, and LGMO Manager, Mr. Benjamin Arizala, the activity was conducted in line with FEED’s ongoing “Living Legacy: Plant a Tree, FEED Our Future” program, aiming to contribute to the sustainable restoration of the country’s forests and natural woodlands, specifically indigenous woods, livelihood and cash crops. 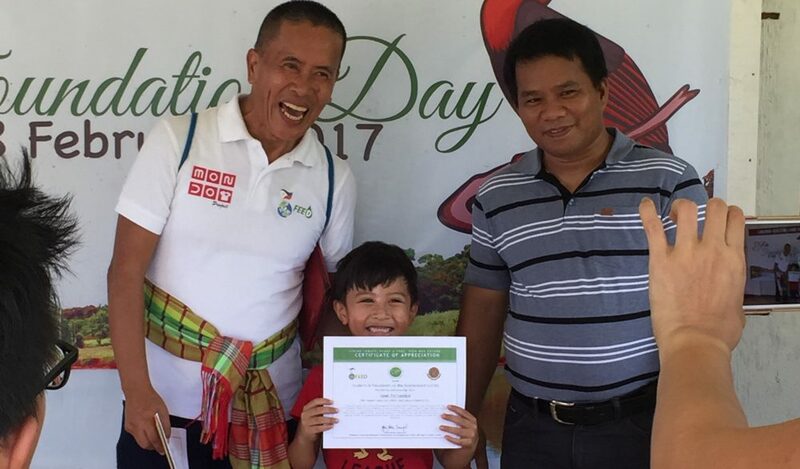 Planted during the event are the seedlings of Syzgium subcaudatum (Malaruhat), Pterocarpus indicus (Narra), Diplodiscus sp. (Balobo) and Syzygium curranii (Lipote), which according to Mr. Arizala are very adaptive species in Philippine mountain environments, and are efficient in reforesting the site. Rehabilitation of denuded areas is one current focus of the LGMO team and the chosen student organization, GeneSoc. The organization has already been conducting activities outside UPLB, aiming to aid communities through different outreach programs and medical missions. 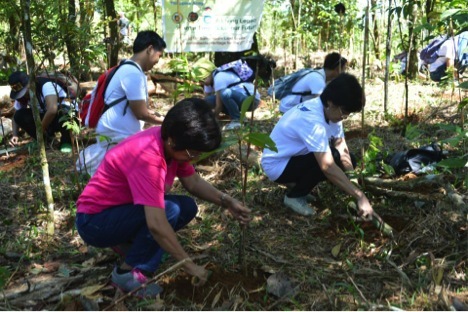 Dr. Raymundo of FEED (front left) and Dr. Mendioro of GeneSoc (front right) lead the tree planting activity in partnership with LGMO-UPLB and AFP at UP Laguna-Quezon Land Grant, Siniloan, Laguna. As handpicked by Dr. Raymundo, Professor Emeritus and former College of Arts and Sciences (CAS), UPLB Dean, GeneSoc aligned the tree planting activity to one of its objectives of plant genetic resources management advocacy. Led by Dr. Merlyn Mendioro, senior adviser, and Maria Quita Guevarra, president, a total of 25 resident and alumni members of the organization participated the event. 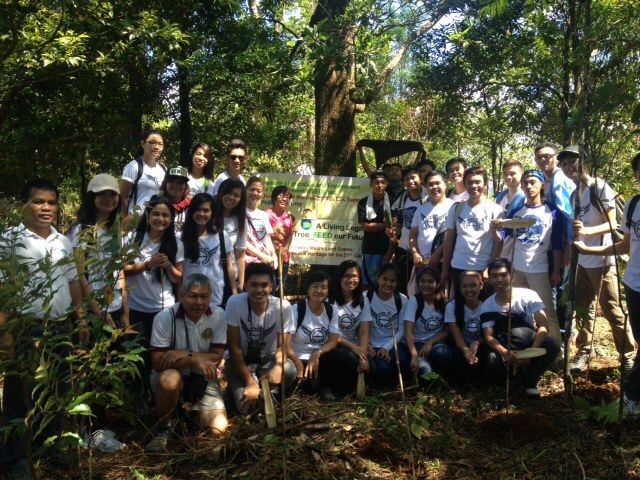 FEED has conducted several tree planting activities in the area and it is the second time they partnered with a student organization in UPLB. “We [GeneSoc] are very happy and honored to be chosen by FEED to be one of its partners. Sana po ito na ang umpisa nang mas madami at matagal pa pong mga partnerships with them,” Ms. Guevarra said. GeneSoc* is currently the CAS Best Student Organization. *The UPLB Genetics Society, also known as the UPLB GeneSoc, is an academic organization based in the Institute of Biological Sciences (IBS), CAS, UPLB established in 1983 by 23 Biology and Agriculture students. Through the years, the organization has strived to promote and create awareness about the science of Genetics in the country; to facilitate the interaction between the faculty and members of the organization; and to give each member an opportunity to discuss trends, activities and ideas in Genetics and its related fields. For the past 30 years, the UPLB GeneSoc regularly sponsors activities including the regular BIO 30 Tutorials, annual BIO 30 Inter-Laboratory Quiz Contest, IQlympics General Info-IQ Quiz Contest, the annual Genetics Week and national events like Genetics Camp and Inter-Collegiate Genetics Quiz Contest. Aside from these academic ventures, the organization has been holding outreach programs in different communities, and has been participating to athletic events within the College. Recently, it was awarded the 2013 CAS Best Student Organization. FEED, GeneSoc and LGMO participants flashing their smiles after successfully planting 1030 plant seedlings in a hectare of land at UP Laguna-Quezon Land Grant. MABUHAY and may you encourage more youth to get involved! Click on the photos below to view the gallery.